During the Keynote presentation of SOTI Sync 2018, SOTI’s annual training and conference, CEO Carl Rodrigues announced the official launch date for SOTI One. November 1st, 2018 will see the platform accessible for all. Below is a summary of the main features and why we are excited! SOTI MobiControl: An award-winning Enterprise Mobility Management platform (EMM) that remotely supports and manages Android, iOS, Linux, Mac and Windows devices throughout their entire lifecycle. It all allows full integration into the Apple’s VPP and DEP programs and supports you in making your fleet of mobile devices GDPR compliant. SOTI Assist: If you want to manage your own devices in-house, one Subsidium MS have provided and set-up your devices SOTI Assist will be on-hand to support your IT team in fixing any problems. Featuring SOTI’s industry’s first help desk solution, ‘purpose-built’ to fix mobile device problems, features SOTI’s award-winning remote-control technology, making it easy to analyse and resolve mobile device and application issues. SOTI Snap: Will enable app building, without the need to code! Apps can be built for both iOS and Android meaning that businesses are no longer constrained to what is in the market, you can build an app that is as unique as your business. SOTI Central: Is your chance to keep up-to-date and be a part of the dynamic SOTI community. 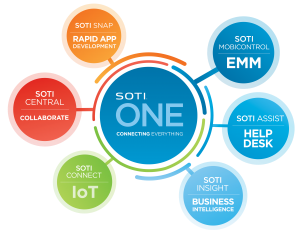 Partners and customers can interact and access a library of products and services for SOTI One.